Not a lot of ministry happened last week, which was a bit of a challenge for me. I’m in a holding pattern with the apartment. Starting to think that aiming for a before Christmas move-in is the best to hope for. (I’m kidding about that…kind of.) Mostly I worked out some details on the apartment and did a lot of relationship building this week. 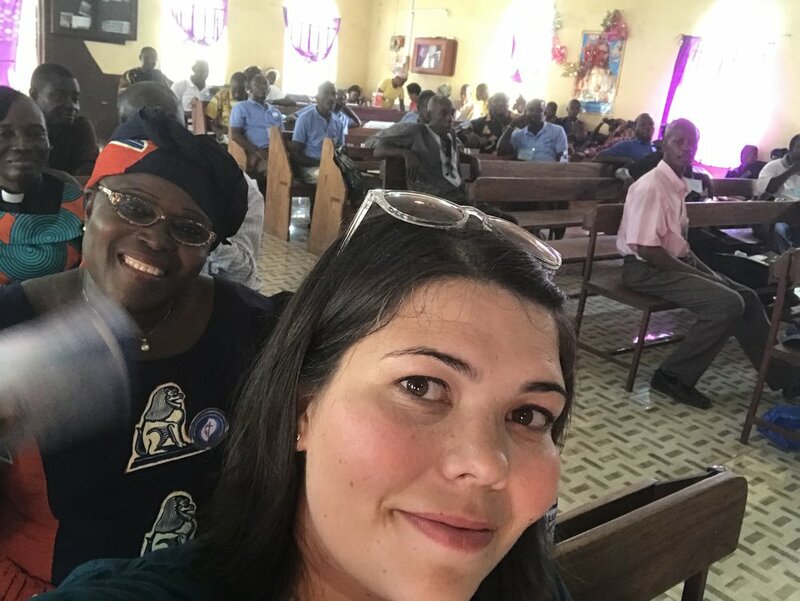 Went to my first Conference Office staff meeting and devotion, practiced Christmas caroling for the prison ministry fundraiser (and I TOTALLY learned a whole song in Krio! ), attended the opening ceremony of the United Methodist Men’s Convention, attended a new church for a 4+ hour worship service. And if I’m lucky, I’ll have a little announcement for you tomorrow on other matters. Stay tuned. So this week I’m going to start a new recurring feature. It’s called What I Love about Sierra Leone. I figure it’ll be fun to see how high the number goes over the course of my work here. So here we go. They’re all about that matchy-matchy life. They coordinate outfits for all the things. For weddings, they will have a theme fabric that everybody has an outfit tailor made from. When I first met the United Methodist Women at the Conference Office they told me that I’ll need something black and something white for the upcoming convention—white for the night before the opening (I have no idea what happens the night before that warrants a new dress, but I’m getting one…and we’ll see!) and black for something else that I have no idea about. I walked into church this week at Bishop Baughman Memorial UMC and they were all wearing outfits from the same fabric that literally had the name of the church printed all over it. This was for the special thanksgiving service. Some wore it as a scarf. Some as a full dress. The men had shirts from it. Some embroidered the fabric. Some had elaborate dresses. Some more simple. They are all about that matchy-matchy life. And I love it. It sure makes you feel like you belong to something. And it’s all kinds of fun and fancy. They insist on giving you a new name. There’s been all kinds of conversation about what my Sierra Leonean name will be. One of the local missionaries, Finda, gave me the name Mari in the Conference Staff meeting on Wednesday. On Friday at the men’s convention, as I was being introduced the UMM leader said that was my new name and Olivia sitting next to me said, “No. 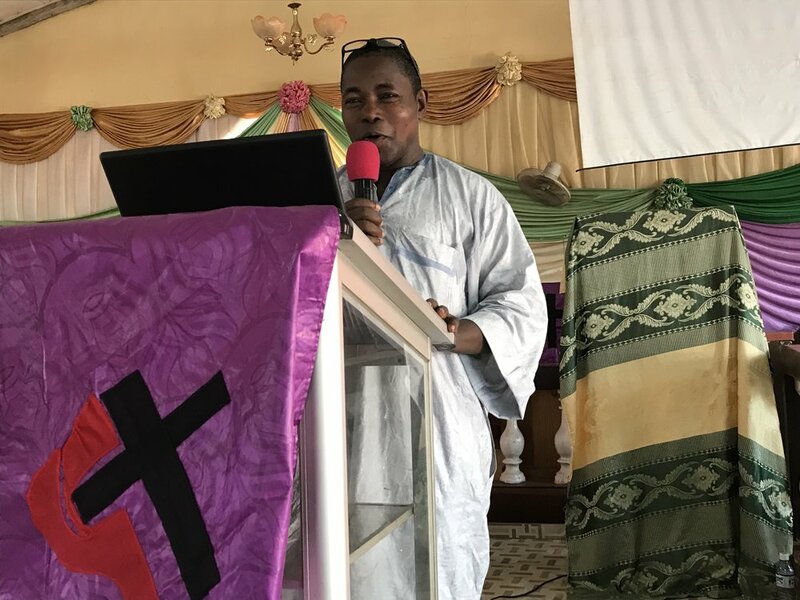 You’re name is Kema.” When I walked out for worship yesterday I was wearing a long Sierra Leonean trumpet skirt that was made for me last week. Everybody in the hotel restaurant ooo’ed and ah’ed. And the security guard said, “You look like a Sierra Leonean, now you need a Sierra Leonean name. What do you think of Fatima?” I think in the end it’s going to be Olivia’s pick because it seems like a good mix of my American name Katie Meek. Kema (pronounced Kay-Mah). I’ve probably spelled it wrong. They have trouble with Katie (the way we pronounce it…more like KD). And so I get Kate and Kahti and Katerine and something that sounds like Kathleen. I don’t know exactly how I’ll be using Kema. But it’s just another way that they adopt me in. Popcorn. You can get popcorn on the side of the street. 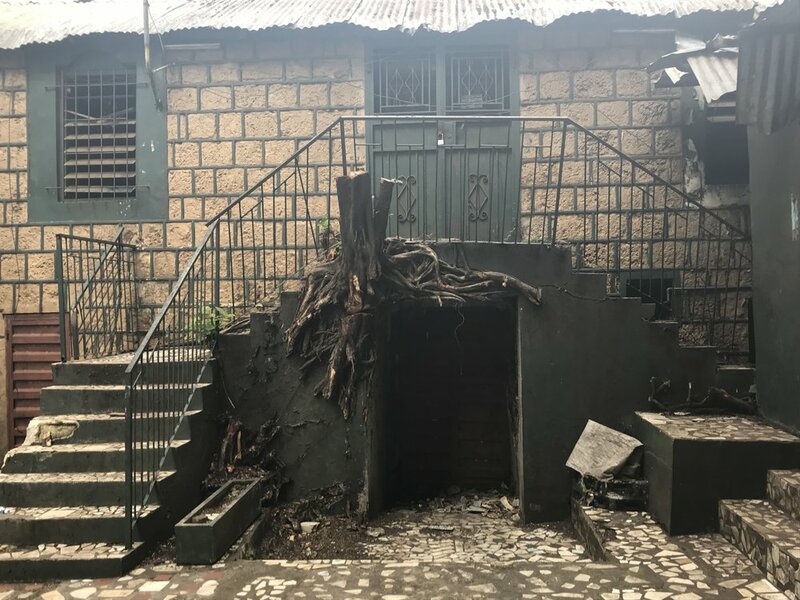 They’ll even come up to your car and sell it to you… along with things like toilet paper or towels or bathroom scales or plantain chips or already-peeled oranges. The other day the women in my car bought three watermelons while we were stuck in traffic from a woman carrying them one at a time on her head. But the one that makes me the happiest is popcorn. 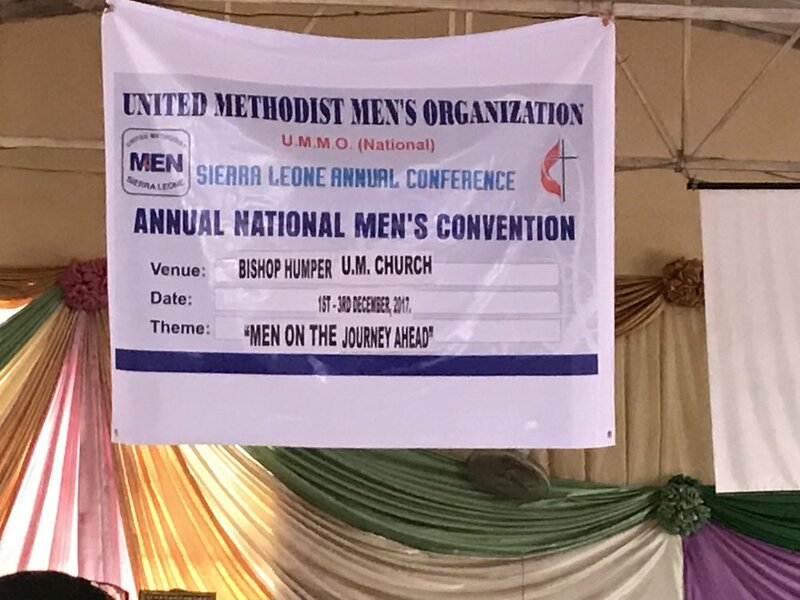 The theme of the Men's Convention was "Men on the Journey Ahead"
Bringing selfies to Salone. This was at the beginning of the weekend on a work day. I expect, just like church, that it filled up slowly over time. 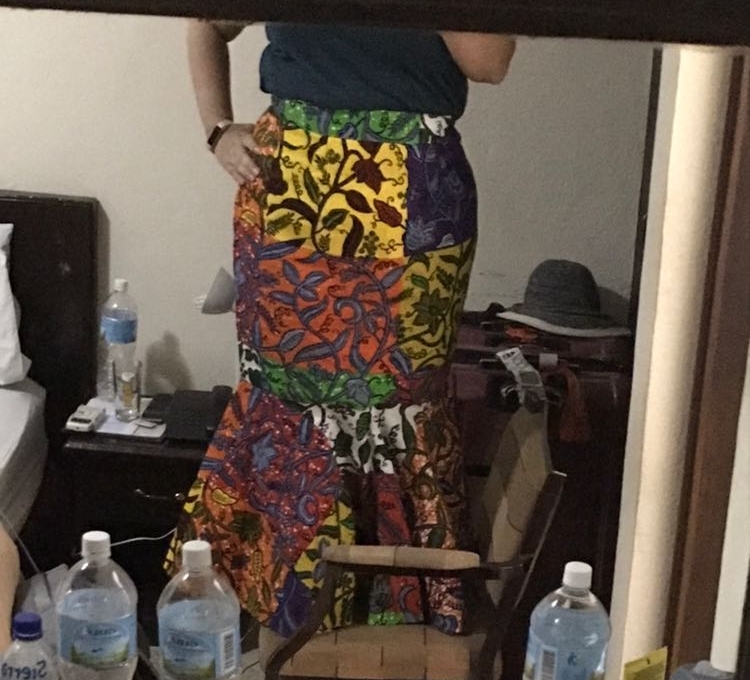 My new skirt for Sunday Morning... sorry for the selfie, it does not capture the beauty.